Having your wisdom teeth removed is a common right-of-passage for most Americans, with around 85% of wisdom teeth eventually removed according to the American Association of Oral and Maxillofacial Surgeons. 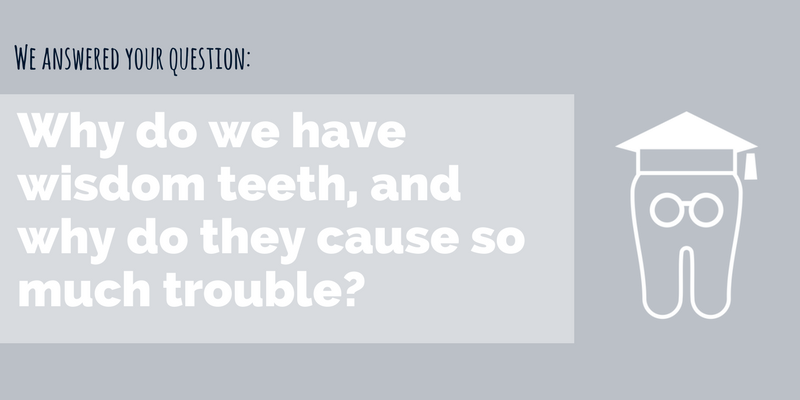 But what, exactly, are wisdom teeth and why do they so often cause trouble? Wisdom teeth are the farthest back teeth on both your top and bottom jaws. They’re sometimes called third molars but gained their more popular name because they come through when you’re older and, hopefully, wiser. You’ll usually see their appearance somewhere between the ages of 17 and 25. That’s roughly a decade after your second molar, which comes in around age 12. Most people have four wisdom teeth, but between 10 and 40% of people have fewer than four, depending on ancestry. Anthropologists believe wisdom teeth were especially helpful for our prehistoric ancestors, who needed serious chewing power to grind through the rough plants, seeds, nuts and foliage which made up the bulk of their diets. As teeth wore down or fell out, wisdom teeth could step in and provide a much-needed replacement. Now that we have a softer diet filled with carbohydrates and high-calorie foods, as well as advanced preventative dental care, we no longer require wisdom teeth. Unfortunately, our jaws haven’t read that memo yet. Scientists now classify wisdom teeth as “vestigial organs”, or body parts that have become functionless through evolution. Currently, less than 2% of adults over 65 teeth have managed to keep their wisdom teeth without them leading to cavities or gum disease according to a 2012 study in the Journal of Oral and Maxillofacial Surgery. Why so few? If you’re one of the lucky ones whose wisdom teeth come in healthy and properly positioned, then you’re set! However, in most cases, there’s just not enough space in your jaw for four more teeth to squeeze in. As the human brain expanded in size, our jaws actually needed to become narrower and the availability of cooked soft foods has also helped our jaws diminish in size. Smaller jaws don’t usually leave room for wisdom teeth to naturally emerge without issues. Instead, they get trapped beneath your gum or bone and pushed up against the teeth in front of them. We call this “impaction.” There are a few different levels of impaction, depending on where the tooth is within the jaw. Soft tissue impaction: The top of your tooth has worked its way through your bone, but your gum is still covering the tooth. Partial bony impaction: Your tooth has partially broken through your gum, but part remains in your jawbone. Partially erupted teeth can tilt sideways and damage neighboring teeth or can create spaces that are hard to keep clean, so they get infected. Complete bony impaction: your jawbone completely encases your tooth. Impacted wisdom teeth don’t always show symptoms, so it’s completely possible that one or more of your teeth are impacted without you even knowing. If symptoms do arise, they may include pain, swollen and bleeding gums, swelling around the jaw, bad breath, headache or jaw ache, or difficulty opening your mouth. The good news is, modern dentistry offers a fix that is much quicker and easier than waiting for evolution to take its course. Oral surgery to remove wisdom teeth is easier than ever. The procedure usually takes less than half an hour, even for all four teeth. There are a variety of anesthesia options available to ensure you’re comfortable during your visit, and medication available to help manage any pain or swelling. Generally, removing your wisdom teeth when you are younger is easier because the roots of the teeth are not as fully developed.